Our current roads are made from tarmac of asphalt, this could change in the future and we could all be driving on plastic roads. 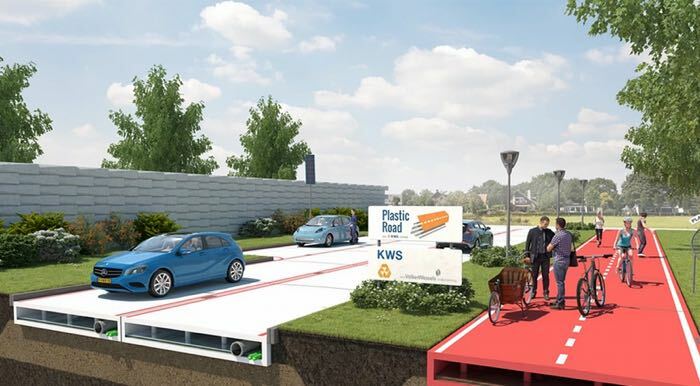 VolkerWessles have developed some new plastic roads that are designed to be easier to build than current roads and also last longer. The plastic roads are constructed from recycled plastic and they are capable of surviving higher and lower temperatures that current roads, plus they are easier to repair. Another advantage of these new roads is that they can be pre-assembled and then laid quickly, which could cut road construction times significantly. At the moment these plastic roads are just a concept, but who knows, one day we could all be driving our cars on them.